But the truth is, Spiegelman has influenced Watchmen author Alan Moore, Chris Ware, and a host of others in the generation of comic artists that followed his own. 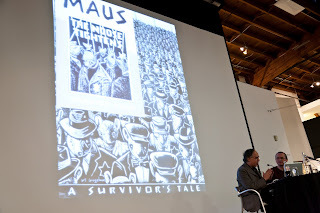 One of Spiegelman’s core ideas, visible throughout his groundbreaking comic memoir of his parent’s experiences in a concentration camp during the Holocaust, Maus, and his surrealist collection Breakdowns, has been that comics can pull apart words and pictures to reorder time in ways that are similar to what contemporary art has done. 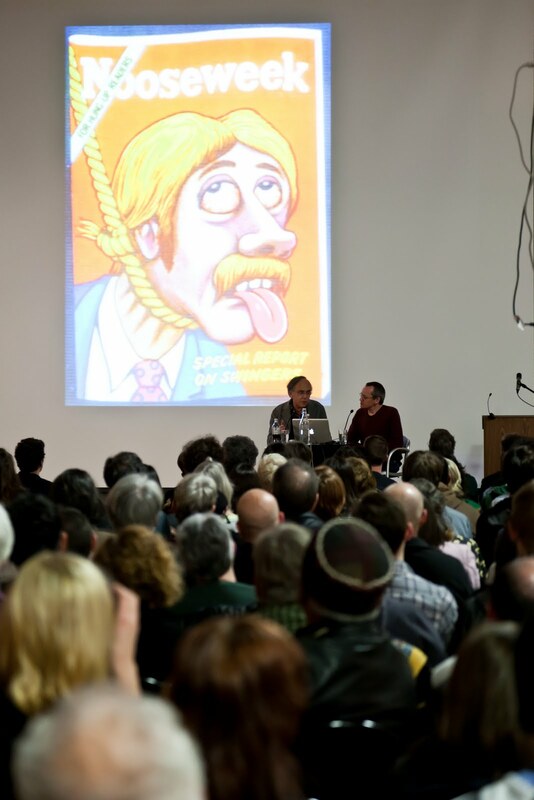 “Comics work the way our brains work. 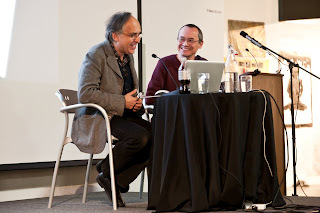 We think in icons,” Spiegelman told Sacco. Events can be re-sequenced, memories juxtaposed, and perception made more difficult in order, like art theorist Victor Shklovsky described, to make the reader’s experience of reality new again. Pulling up an image of an early 70’s panel as an example, Spiegelman called this reordering “the grammar of comics.” He has often stretched this to conceptual levels, an experimental sensibility he blames on early exposure to Mad Magazine. “I was oddly imprinted very early like a baby duck with Mad. It was like tree, rock, Mad,” Spiegelman said. “Once I realized that comics were made by people, I wanted to be one of them.” As the child of immigrants, Mad served as a fractured guidebook to American culture and values. “I was nurtured by Mad Magazine, basically.” In addition to Mad, his father bought him vintage comics because they were a bargain, not knowing comics had been censored starting in 1954 for violence and sexual imagery. “Comics were giving us important toxins,” Spiegelman said at Literary Arts the next night, “Horror comics were a way of post-Holocaust Jews to deal with that horror.” His awareness of using comics as a vehicle for cultural commentary had begun. 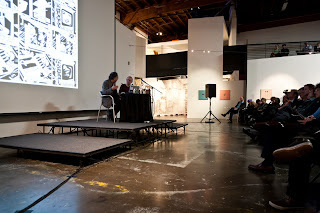 It was through connections made at Top that Spiegelman met R. Crumb in 1966 and was influenced by him to move into more underground comics. 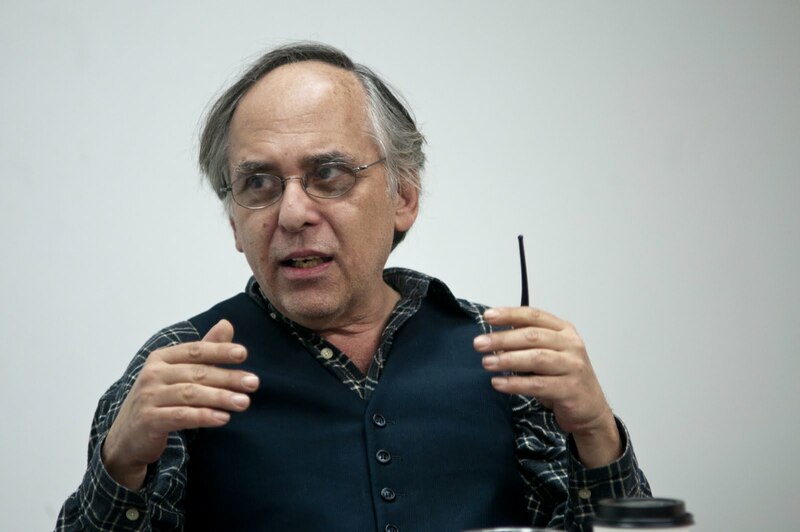 “Get in touch with your inner psychopath was the basic idea,” Spiegelman said, gesturing with both hands. “Very unsettling stuff,” Sacco said. The late 1960s were a cultural moment interested in pushing the boundaries of the acceptable, and underground “comix” were the opposite of the safe, censored comics of the ’50s.